After weeks of taking a break from playing Powerball and Mega Millions, a lucky Huntingtown couple gave the games another try and won their biggest Powerball payday ever! The Calvert County husband-and-wife team are still shocked by their $50,000 fortune in the Jan. 30 drawing. Their journey to Lottery success began when the 53-year-old husband went home early to meet a cable company representative. He stopped along the way at Dunkirk Fastop located at 9880 Southern Maryland Boulevard in Dunkirk. 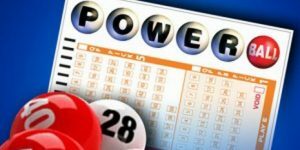 After weeks of playing only scratch-offs, the loyal Lottery player decided to play two sets of random numbers on a $4 Powerball ticket. The drawing was that night and the lucky winner didn’t check his ticket until the following Saturday. He scanned his ticket using the Lottery’s mobile app and saw that he and his wife were winners. His wife yelled, “Check it again” because she didn’t want any future disappointments. The lucky man has worked in construction for 30 years. He and his wife plan to use their prize for home improvements and to boost their savings account and their beloved grandchildren’s college fund. “We’re two happy grandparents, we love our grandkids,” they said. No one hit the jackpot, so the prize for the Feb. 6 drawing rolled to $204 million with a cash option of $124.2 million. This entry was posted on February 5, 2019 at 12:44 pm and is filed under All News, Calvert News, Community, County, Good News, More News, z 600X120 Top Ad Bottom, z 600X120 Top Ad Top. You can follow any responses to this entry through the RSS 2.0 feed.